Antares hot fire on February 22 (Credits: Orbital Sciences). 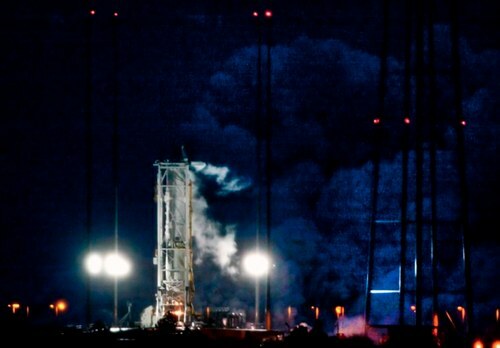 On February 22, just over a week after a last second abort, Orbital Sciences Corp. successfully put their Antares rocket through a hot fire test. The troublesome valve whose failure to open interrupted the first attempt made no appearance on Friday. The 29 second test at Wallops Island paves the way for Antares’ COTS demonstration mission to the International Space Station in April. “I know that I speak for the entire Antares team when I say we are beyond excited to know that our newest rocket will take to the skies in just a matter of weeks,” said Antares program Manager Mike Pinkston.